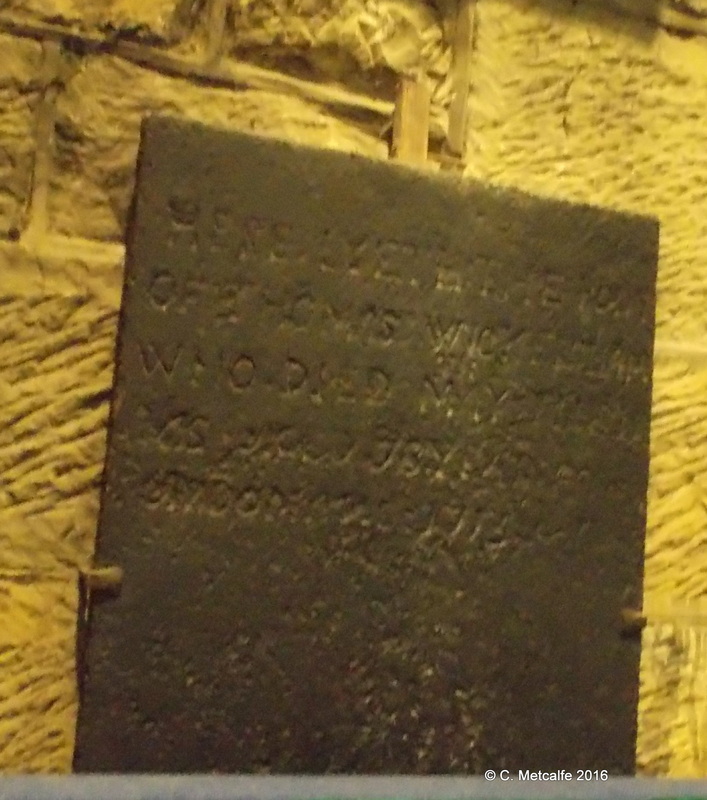 Here is what is known of two more iron grave slabs in St Swithun’s church. One is mounted on the north wall, under the Oxford Movement window. 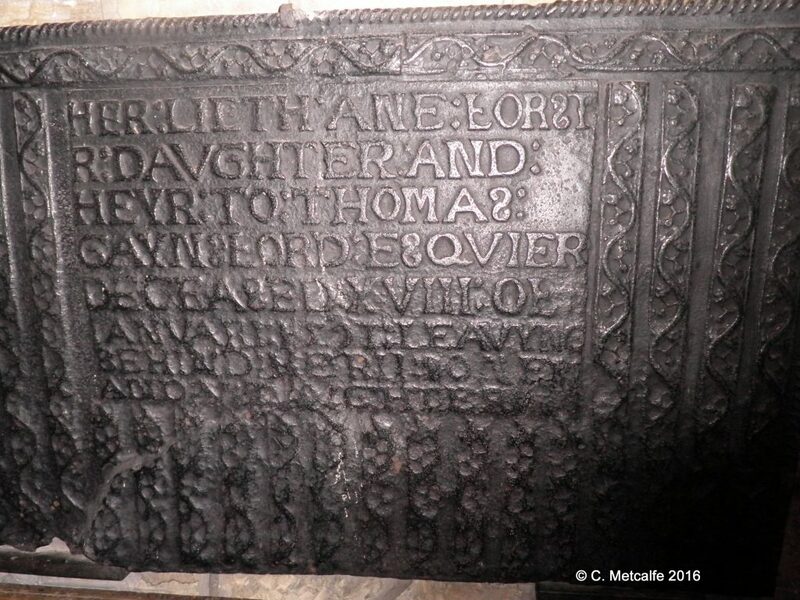 HER LIETH ANE FORSTR DAUGHTER AND HEYR TO THOMAS GAYNESFORD ESQUIER DECEASED XVIII OF JANUARY 1591 LEAVING BEHIND HER II SONES AND V DAUGHTERS. Some of the spelling seems odd to us. The letter ‘F’ is upside down, the ‘S’ is reversed. The ‘Forst’ part of the lady’s surname is on the top line, with the ‘R’ on the next line. This tablet was quite crudely written, perhaps by a monument maker who was not too sure of the letters, or even illiterate. In a way, this makes it more interesting. It is easy to imagine the sheer hard work of creating a mould to produce those letters, and the heat of the molten iron which was then poured into the mould. This grave marker has clearly been used as a fire back at some time in its life. Heat has distorted it and made the lower part very thin. This particular iron grave marker was for many years at the house Hurst-an-Clays, and was restored to the church ‘through the kindness of Mrs Arthur Musgrave‘ in October 1933. Anne Forster apparently died on 18 January 1591, leaving 2 sons and 5 daughters. She claimed to be the heir of Thomas Gaynesford, Esquire. One Thomas Gaynesford owned part of the Manor of Brambletye in 1548, so this might be her father. There are similar iron slabs, in other Sussex or Surrey churches, including St Peter’s church, Ardingly. The Gaynesford family is connected with the Wakehurst and Culpeper families of Ardingly, so Anne Forster is likely to be their descendant. There is much that we don’t know about this artefact- why were so many copies made and for whom? Were the copies for relatives, or some of her children? Did the people who commissioned the monuments realise that they all said ‘Ann Forster’? Or did she, or her executors, wish to have multiple copies made, for different churches connected to her, so that she could be remembered? Were the slabs originally laid inside or outside the churches? How did one come to be at a house on Ship Street in East Grinstead? HERE LYETH THE BODY OF THOMAS WICKERSHAM WHO DIED MAY THE 11 WAS AGED 78 YEARS ANNO DOMINI 1713. 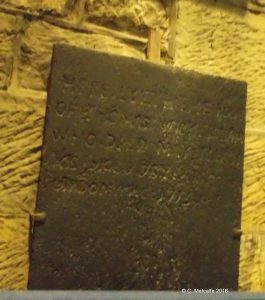 This slab is inscribed in incised lettering, a form used on stone graves, too, in contrast to the raised letters on the Anne Forster memorial. This slab was unearthed on November 18th, 1931, but the old Guide Book gives no details of where it had been. These iron grave markers are fragments of the Sussex iron industry and serve as monuments to Anne Forster and Thomas Wickersham, but also to those who worked in the iron works, and those who fashioned these monuments.